A seasoned angler will hardly ignore the importance of a fish finder because fish finders allow you to find your fish in the least possible time. It does not only save time but makes you more fascinated with fishing. The newbie should also go for a fish finder because this will make it easy to know the angling more and understand the ways of fishing. Some anglers are really good at catching fish but what if you don't get any fish to catch? This is where fish finders aid you. Not only fish but some particular aqua creatures that are underwater can be found in this way. It will provide you with the options for viewing the aqua structure, depth, hiding the location of the fish, speed and the temperature. Both moving and steady objects can be seen that are below the surface of the water. So not only for finding fish but also to know the area, you should go for a fish finder if you are an angler. In this piece of writing, we have conveyed you the accurate guide for purchasing your own fish finder and we also have advocates best fish finder under 200 dollars that have effective configuration and motivating features in company with the positive and negative facts. Best Fish Finder for the Money! Do you want to see more of the water that is around you? Go for the Garmin Striker 4 GPS Fish Finder. It has added high-frequency CLEARVU SCANNING SONAR which will provide you with photographic images and details of the closed areas. This is a simple fish finder that is easy to operate and install for anybody because it has keyed interface along with buttons. The available displays of this fish finder are 3.5 Inch, 5 Inch, and 7 Inch. The water rating is IPx7. As we have already said, with this fish finder, navigation will be much easier because it has got the waypoints map. The GPS of high-sensitivity can detect the position where you are keeping the relationship with the waypoints that are marked by you. Locations such as the stumps, docks, and the brush piles can effortlessly be indicated by the fish finder. Using the waypoint map, you can effortlessly mark, view and navigate to the locations such as the stumps, docks and brush piles. The maximum depth of the finder in freshwater is 1600 feet and in the saltwater is 750 feet. It also includes chirp Sonar for the better target and built-in flasher. This is a great fish finder for fishing in freshwater, saltwater in-fishing along with WiFi connected wireless. This fish finder is cast able, smart and portable and the best part is you do not require any Cellular data or Internet. All styles of fishing are available with this finder such as fishing kayak, river, ice, bank, boat, float tube fishing, you can do it all. This is the only portable Sonar available in the market with the GPS ability along with onshore bathymetric mapping technology. Not only this, this fish finder can handle four different fishing types of four different seasons. 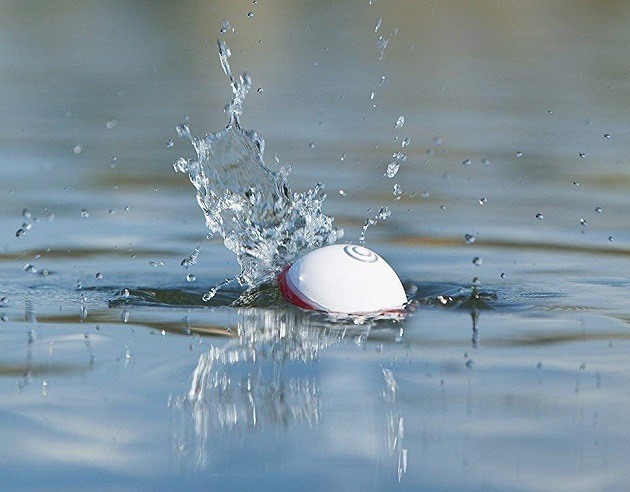 No matter you are going for shore fishing, boat fishing, kayak fishing or Ice fishing, for the four different seasons, the smart SONAR of this finder will find your target easier than any other device. This is named accurately as the PRO+ as it has the perfect casting ranges and the best part is the use of WiFi over Bluetooth. The scanning frequency of the beam is wide for getting you your targeted fish faster than ever. The screen so contains incredible details. So, now you can craft your own map and can also analyze in on your PC. The connection range of this finder is 330 ft which can analyze any bodies from .5 inch to 260 ft depth. The T-Box is one of the most effective fish finders because it has a mounted system with a boat that can be accessed to the power supply of one 12 volt power. The names say it is SonarPhone which means it can turn your smartphone or your tablet into an entirely connected functional Sonar system. The power supply of the 12 volts is not included with this device. You can get it from any drugstore or shop if you want. As we have already stated, the best thing is you do not need any phone coverage. For sharing this you own signal with your friends (as may friends you want to,) all you have to do is go to the APP store and download the app is free. This app will work both for the IOS and the App Store. You will get the neoprene armband will be included with the kit for your safer access to the phone display. The one year warranty already tells you about the quality of the product. It has Wifi technology which is patented and can transmit to the phone and tablets and it also can create its own WiFi hotspot. It is available in limited language collection of 17 languages along with 3 different configuration systems. It also concludes depth and water indicators in conjunction with holes for additional accessories that are pre-drilled. 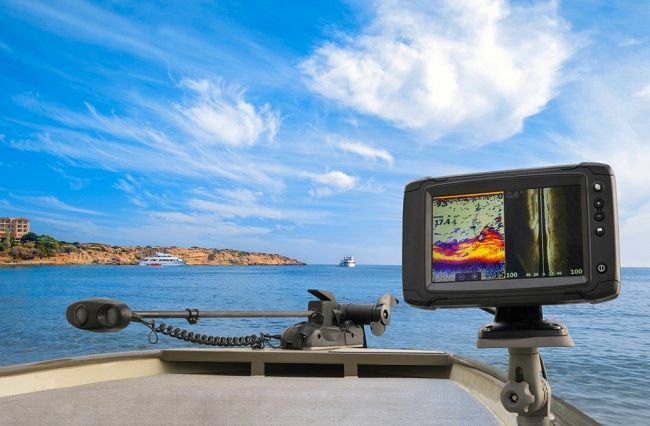 This Marine Fish Finder is a full high definition color display finder along with the sensitivity adjustment of 100 levels. This also has a multi-level range for depth and includes auto-zoom tracking within the bottom which will definitely intensify your prey for fish. It has got 3 different operating modes for different environments. The different operating frequencies are 83 kHz and 200 kHz where one is for deep water and the other is for shallow water. The depth is audible and it also has alarm make it easier for you to find fish. All these models are equipped with the Intelligent Sonar by FishTrax which will allow you to tweak the finder for adjusting with any of the fishing platform and any fishing techniques. It has affectability modification of 100 level and the extra accessories of this finder aid you to adopt the platform effortlessly. So no matter where you are, in the Kayak, Boat, Float Tube, Dock, Canoe, Bank, Ice, you are always ready with the best finder of your time. The power of the 4 batteries are of AAA and the design is made to save the weight. This will auto switch the dual-beam for your convenience. This fish finder has TFT color LCD screen which is 2.4 Inch and can display can detect the underwater contour, depth of water, a temperature of water and fish sizes. Two different modes are available; Wireless and Stimulation.It has a sonar sensor along with transparent replacement cover.The added attractive lamp, screen brightness, depth, and fish alarm, fish icon, language selection, units alert and detecting sensibility makes it a perfect fish finder. The depth detection ability is 147ft and the operating range is 196ft. The sonar sensor will help you find your fish and the location details when you are in any dark zone. For the detection of your targeted fish, the fish attractive lamp is very helpful. It provides you the ability to operate the Wireless range about 60m as it has an antenna on the top (left) of the device and the detecting depth of the device provides you to detect the depth of the water up to 40m. The brightness of the screen will aid you in the dark area and the zooming feature will also provide you with easy operation. It can hold charge up to 10 hours. This is an ultimate fish finder with the best fishing edge. It is tested for DEK-IT mounts and has a GPS system added for easy fish finding. The multitude choice enables you to choose between flat pitch and the angled pitch. It is constructed with aluminum that is marine grade and can be customized if necessary. The coating paint is of powder which makes it last for a long time and has a solid body and strongly attached gear. Attached accessories are great. For supporting all the electronics and for maintaining the competition, the tested mounts of this finder will make it easy for you to get your prey. Forgetting a range of choices added with premium quality, the boating enthusiasts are going to get ideal fishing. This finder is a portable and versatile fish finder as it will adjust most of the fish finders and GPS brands. As we have said that it has Powder Coated Paint, this paint is long-lasting and it describes the beauty of the finder. For longer exposure time to the element of water, this finder is tested. 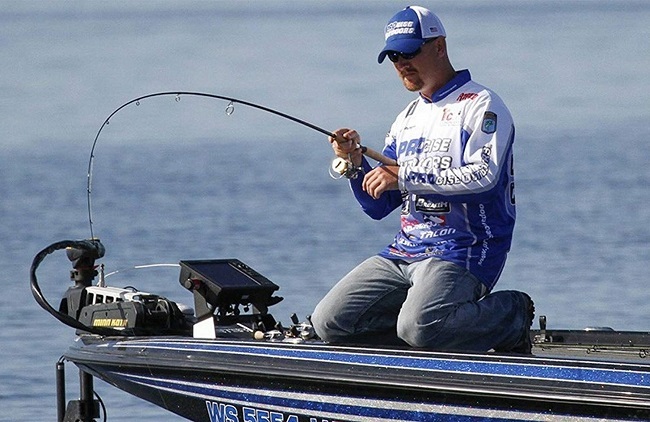 The Bassmaster Brandon Palaniuk is also tested and it will help you to keep your gears attached with the finder reducing the rate of jarring or bouncing as this device is solid. With the high definition display of 4.3 Inch backlit LED, this Raymarine fish finder is a must-have if you are a PRO angler. This finder is optically for the sharp color but has not interior fogging which provides you a clear view. The angle is wide-viewing and it has a dual-channel sensor. The CHIRP is also ultra wide and with this incredible CHIRP you are going the get the clearest images from your fish finder. It will let you see underwater up to 600 ft. so that you are able to know where your target is no matter how dark the place is. The high speed, while you are tacking the bottom, is very much reliable. The Dragonfly Mounted Transducer of this finder pairs up with the CHIRP element which also includes a wide beam and they together will afford you has an outcome which has subsurface visibility. The Down Vision sonar of wide-spectrum CHIRP is for images and the conventional second CHIRP sonar is to target the fish. It also has a Wi-Fi system available and added temperature sensor. For all the iOS and the Android devices, this iBobber can be the best fish finder. This fish finder is wireless and has a waterproof phone case included. It also has got Sonar identified fish finder technology with LED Beacon. The battery is rechargeable and the readings are accurate. The depth it can reach to is 135 ft and it has 2 swivel snap connections. Bluetooth can also be linked up with the device and it is perfect for all freshwater and saltwater fishing. The smartphone has a diagonal size of 6 Inch that will suit any shape of the phone. The light indicator is great which this device includes. When you are fishing in any dark zone, you will need light to find you fish and catch this. The battery life is durable and after one full charge, it works for about 10 hours. There is also charge indicator that will let you know about the charge of the battery and if you need charge then you can charge it up easily. The app of this device is free and you can use this in both iOS and Android as we have stated. It can sync up to 100' distance with the Smart Bluetooth. The perfect fish finder for all the seasoned anglers along with the beginners can adjust with the fish finder easily. The display of this fish finder is 5 Inch WVGA. This finder has got the Dual Beam Sonar plus CHIRP for locating your target easily and in no time. This dual beam builds the legacy of the innovative SONAR. The way of the returning of the Sonar is properly commanded by this fish finder. It has 2 different display mode and these will help you in adjusting your condition of fishing on the fly. Though it bears a plain display, the display contains the information related to the temperature of the water, the depth of the water and the turbulence. You can also experience the pure presentations in only one touch or push on the button. For adding a new dimension the 2D fish finding provides you SwitchFire. The GPS can surround an area of around 2.5m and affords you faster information. The internal GPS Chat is plotted with the integral Anima cartography. For the optional maps that you may need, this Helix 5 has an SD card slot for adding a micro SD card so that you can save the waypoints. This fish finder has Bluetooth connected wireless system which is castable and portable. This fish finder is much compatible with your Android and iOS devices. No matter what kind of fishing is it, shore-fishing, kayak-fishing, river-fishing, any saltwater and freshwater fishing will seem perfect with this finder with this 130ft depth and adjustable sensitivity! As we have said, it can work down to 40 meters of the surface both in the freshwater and the saltwater, this will be a perfect finder for every time. The temperature sensor of the device can afford you the exact temperature of the water where you are fishing. The real-time image will also be provided so that you can travel through the underwater. For the higher accuracy, use can use the narrow beam of 290 kHz and for extended research go for the wide beam of 90 kHz. We recommend it for every kind of fishing, especially for the Shore fishing. Even if you fish in the onshore, you can also get the most informative data that you will need for finding your prey. The temperature range is between 4 degrees Fahrenheit to 104 degrees Fahrenheit. It also includes free applications like a colander, weather, dairy, sharing function and maps. Your money is important for you and so you cannot invest it in any fish finder you want. Before purchasing, you should know the basic details for setting on a fish finder otherwise your money will be a waste and you will not get your desired finder. We are providing you some guides for selecting the ideal fish finder for you. Before selecting any fish finder, know that it is equipped with GPS or not. With the help of GPS, you will get to know your own location and also about the things that are under or beside your boat. For productive fishing, this kind of information is highly appreciated. Most of the fish finders of these days are equipped with the GPS locator; this makes the work of locating and targeting fish unproblematic for you. For the beginners, it is a great way to start fishing with a GPS equipped device. No matter how much information a fish finder can afford you, it has to convey to you the message properly. This is when you need a high-quality display that can create colorful images. If you do not get the proper images or videos then you may not understand which one is your target. On the other hand, higher resolution display makes you interested in fishing more. Data that are displayed are also flexible. This allows you to get the information just as you like it which makes the info easier and more understandable for you. Just as the high-resolution display is the foremost concern, the perfect size of the display is also imperative. We should say that the larger the screen, the better the view. The larger screen makes the videos and images more understandable and viewable for you. If you are at the end of the both, then also you can see the imaged clearly if the display size if large. Usually, many of the fish finders have got the ability to use maps for finding fish. The chart of maps is provided with the device. Some of the finders have an option of add or custom some other maps so that the fishing gets easy. This option is highly preferable. When you get the option of using a removable storage, you can take the information of the place where you are fishing and can keep the info in your PC for further fishing. Wireless device means the ability to connect with the other devices such as the tablets or phones. In this way, you can control the fish finder and will get the data such as the navigation routes, waypoints, and maps. Before purchasing any fish finder, get to know that if it is compatible with your devices or not. Do you have a plan for jigging vertically in the water deeply? Or do you want to spend a lot of time in ice fishing? If the answer is YES then before purchasing any fish finder get to know that the finder includes flasher or not. This function will help you eliminate the unnecessary and the unused information which will allow you concentrating on the lure and the fish. The behavior of the fish highly depends on the water temperature. If you don't know the temperature of the water where you are searching for prey, then you might get into a wrong place. Sometimes the water temperature influences fish and they usually move from a place to another and if you fish there then you will never get one single fish easily. So before buying, ensure that there is a temperature probe set inside the transducer to let you the rating of the temperature. When you are up for shopping for a new fish finder that can adjust your budget and also provides the best out of it, the experience can be daunting. People who are seasoned in angling really get into a dilemma because they expect so much from a fish finder but they high expectation cannot be fulfilled due to less payment. All we can say is there is no BEST FISH FINDER in the entire world. Every coin has two sides and there will always remain flaw. Fish Finders under $200 can rarely be perfect but all we are aiming at is to cut down your to-buy list and make reasonable so that you can catch more fish at a less expense. Garmin, Helix, Raymarine Dragonfly, and Humminbird are thought to be the best fish finder in the market nowadays. But any of the product mentioned above because we have selected the product after elevated research. For the best fish finder under 300, select anyone from Garmin or Raymarine Dragonfly as they provide high-quality GPS facility. These are the best fish finder GPS combo. The Humminbird fish finder can be perfect if you are judging on the basis of portability and for ICE Fishing, keep an eye on Garmin and Helix. Is the battery life of fish finder important? Yes, battery life is very important for the fish finder. If your fish finder’s battery drains when you are fishing then you can’t go fishing anymore. If your fish finder drains so much battery of your phone then also it will get problematic. Select a battery that has a long life. What is the work of GPS in fish finder? Usually, the GPS is a fish finder works as a locator of fish. Just the location of you, the GPS will help you to locate your surrounding and it will also let you know about the objects that are near to under the boat. How does the best fish finder work? Fishfinders that we usually use for finding our prey is basically SONAR unit. These can easily create sound waves of high frequent into the water. This frequency then bounces off any of the solid objects that stay in their path. The SONAR unit basically gathers the returning waves and it can process them with the help of a tiny computer circuit. This data is then translated into some visual representation that says a lot about the water. In short, in this process, the time of the sound wave hitting something and coming back to the transducer is measured and in this way, the depth and the prey are usually targeted. Different fish finders will provide you different signals. Some of these finders can afford you more signals that the other one. The GPS data in the fish finders you do not only get to see where you are but also you get know the locations of the water clearly. What is fish finder Sonar sensor? Sonar sensor is the technique that can use the sound propagation for navigating and detecting objects that are under the surface and water. Fish finder with sonar sensor provides alarm and sounds for detecting fish. Can I use fish finder from a shore? You can use the fish finder from a shore but all the fish finder will not work. The fish finders that have good GPS along with ideal depth-ability and locating-ability will work from a shore. Choosing the best fish finder is not an easy task and for this, you know your own requirements. The first thing you need to know is the place of fishing. Get to know about the place such as it is onshore, offshore, kayak fishing or ice fishing. Then get an idea about freshwater and saltwater also. After that, you have to find out what kind of fish finder do you need, is it conventional or modern. After doing these, get to know if the device has a GPS facility or not. Then ensure that your device also contains a high-quality display and bigger display screen. The flexibility of the system must be noted and the installation type should be easier. The water temperature probe along with the flasher and the portability is also very important. Removable storage should be used with the device and the built-in charts and maps are also a crucial fact. There should be options for customizing maps. One of the most important things you have to remember is the Wireless network setting which much is added as a feature with the appliance. Does fish finder work in ice-fishing? Not all fish finders work in ice fishing. Some of the specific finders are had particular technology that works in the ice. You can really be overwhelmed seeing a range of fish finders with a lot of features and facilities. There you can find a plethora of various models and brands available. Different manufacturer works in a different way and so the features of the fish finders vary from brand to brand and model to model. In this way, fish finders are getting acquainted with a number of innovation. But the confusion still remains, what to choose! The best thing to choose an ideal electric device for you is using it for long-term. But is it possible to buy every model and try them? A louder NO is heard and so you can go for the models mentioned above. Features and capabilities may be identical to so many products so don't be fool paying excessive money for the same facility. Research and then go for buying. So, now that you know the details if selecting the ideal fish finder for you, the choice is yours. We have suggested best fish finder under 200 dollars but these have the potential to beat all the leading and luxurious brands of finders in the market. Go for adventure and go for fun. Select a perfect fish finder and rock the water as if it is your home.